Every year since 1993, Paris’s professional organisation for bakers and pastry chefs has staged a competition for the city’s best baguette. In past years the prize has gone to such well known bread luminaries as Lionel Poilâne, Eric Kayser and Dominique Saibron. This week the 2012 winner was announced: Sébastien Mauvieux of the eponymous boulangerie in Paris’s 18th arrondissement. 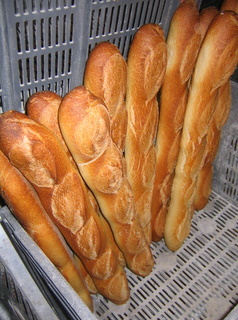 It’s an award well worth winning: with the cash prize of 4000 euros comes the right to supply the President’s Elysée Palace with baguettes for one year, and publicity that pretty much guarantees a 20% increase in sales at the bakery. The competition and accompanying media circus could be seen simply as a sign of how seriously the French take their daily bread. It’s true that many Parisians prize their baguettes and will criss-cross the city in search of the best crust, the finest crumb and the richest flavour. But while French bread is all of a sudden on a roll, with media-savvy Parisian bakers regularly grabbing headlines in France and abroad, the quality of this pre-eminent symbol of French life has not always been the best. The rot set in during and after the Second World War, when rationing and a scarcity of qualified bakers took their toll. By the 1960s, dreadful things were being done in French bread’s name. Additives abounded, flour ‘improvers’ did their worst, mechanisation was [over-] enthusiastically embraced, doughs and breads were frozen raw to be resurrected in bake-off terminals. The results were big blowzy, tasteless white loaves – think bread on steroids – and baguettes bought for breakfast that were limp by lunchtime and had developed a severe case of the droops by supper. As quality plummeted, so too did bread consumption in France. At the beginning of the 20th century it averaged around 900g per person per day. By the end of the millennium, the figure had dipped to a meagre 150g (about half a baguette) per head. By the beginning of the 1990s mutterings about the dismal state of the French loaf were swelling to a chorus. Millers, bakers, food writers, broadcasters and consumers all agreed that something had to be done to rescue this most emblematic of French foods. And this being France, the government got involved. From 1993 a number of bread decrees came into force, designed to put back the soul in France’s bread, restore pride to the baking profession and – it was hoped – boost flagging sales. Two key provisions were that the terms pain maison (house bread) and boulangerie (bakery) could only be used where dough was raised, shaped, proved and baked on the premises. And a new (though actually old-style) type of bread named pain de tradition française, ‘bread in the French tradition’ was introduced, containing just four ingredients: flour, salt, water and a leavening agent (yeast and/or sourdough). No additives, no freezing at any stage of the bread making process, just good raw materials, skill, plenty of time and TLC. By the mid-1990s the renaissance of French bread was underway, brilliantly chronicled in Steven Kaplan’s seminal book Good Bread is Back. Fine bread had always been made by the likes of Lionel Poilâne, but he’d been something of a lone voice in the wilderness. Now he was joined by a new wave of massively talented, entrepreneurial bakers. And they were ready to conquer not just Paris, but the world. One of the first to put French bread back on the map was Eric Kayser on rue Monge. A passionately committed master baker, his gently kneaded, slow-proofed sourdough loaves are numbered amongst France’s finest. His nineteen boulangeries are dotted around Paris and there are 80 more around the world, from Dubai to Seoul, Tokyo to Beirut. At the other end of rue Monge is Dominique Saibron, whose superbly aromatic organic baguettes (and around 20 other breads) bring customers flocking from all over Paris. A self-taught iconoclast, Saibron once worked for the Carrefour supermarket chain, transforming their bread operation and triumphantly disproving the notion that supermarkets can never produce decent bread. Now working independently once more, he too has 14 branches in Japan and recently opened a huge flagship bakery in the 14th arrondissement. The pool of Paris’s talented artisan bakers is impressive and constantly growing and there’s never been a better time to buy good bread in the city. Book your ticket to Paris and work your way through a week of intensive bread-tasting. Look for the pointy ends that characterise a proper artisanal baguette and a wonky, anarchical aspect (no two will be identical). The crust will shatter tinily beneath your teeth, the crumb will be creamy and golden with huge, uneven holes and an almost buttery flavour with hints of toasted hazelnut. By the time you’ve munched your way through a selection from the bakeries listed below, you’ll be in a position to award your own prize for Paris’s best baguette. Previous: Previous post: Alsace wine is all white, right? Wrong! Next: Next post: Alsace vs Baden: which side of the Rhine has the best food?